Textiles hold special meaning for different cultures. They can physically as well as emotionally touch us because of the special stories and memories they hold. 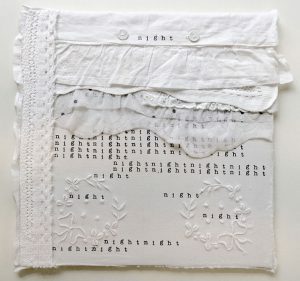 This small hand embroidered pillow case that I found in a vintage shop, is an envelope which contains some secret stories belonging to a special person in a special place. It represents safety and security, where sleep and rest and shelter from the ups and downs of the day is guaranteed. The piece also includes fragments of other related stories coming from remnants of blankets and lace curtains which, together, provide warmth and protection from the storms of life. The use of a ceramic domestic tile offers the further meaning of privacy – these special stories are only known and understood by those who belong to this special place and are not shared readily with outsiders. ‘night night’ – a special phrase which is reserved by a mother as she tucks her child into bed or between lovers as they kiss each other good night – refers to special identities and special relationships.